Heat oven to 375°F. Line 24 muffin cups with paper baking cups. In large bowl with electric mixer, beat cake mix, bananas, water, butter and eggs on low speed 30 seconds. Beat on medium speed 2 minutes, scraping bowl occasionally. With spoon, stir in chocolate chips. Spoon batter evenly into muffin cups. Bake 18 to 22 minutes or until toothpick inserted in center comes out clean. Remove from muffin cups; place on wire racks. Cool completely, about 30 minutes. Spread frosting over tops of cooled cupcakes. 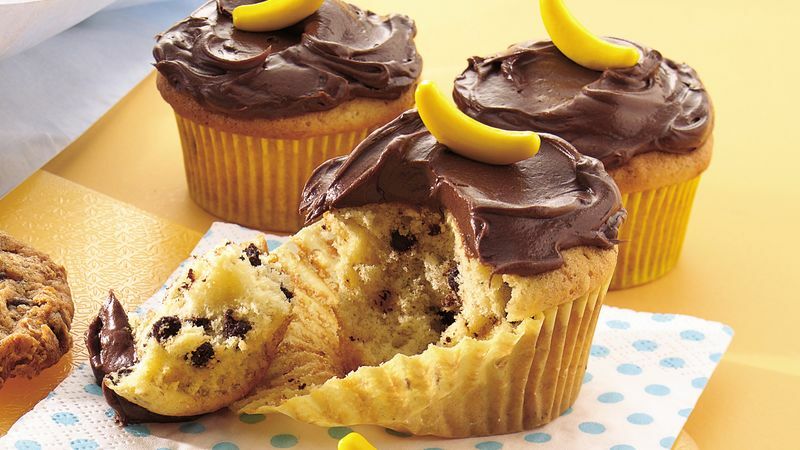 For fun, garnish cupcakes with banana-shaped candies. Look for them in the candy aisle of the supermarket.